Just over a week ago, the first poster of a three-part image for Oz: The Great and Powerful showed up giving us a glimpse at Rachel Weisz as the Wicked Witch. 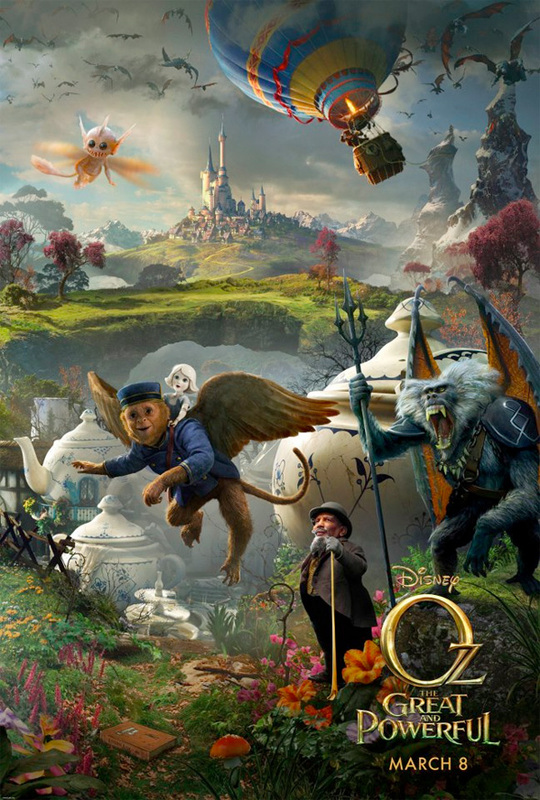 Now the second part of that image is here with some flying monkeys, James Franco in his out of control hot air balloon, a creepy pixie, that little porcelain girl from the teaser trailer, a book that we can't make out and Tony Cox (Bad Santa, Me, Myself & Irene) as a character named Knuck. The image quality is poor for now, but we'll be sure to replace later so you can see all the details of our return to the world created by author L. Frank Baum. Check it out below! This one is way too busy for me. The original teaser poster is great. Honestly, this is cliche. Is Sam ever going to create something original again? Why is Sam trying too hard to copy Del Toro? I mean even the cheesy fairy with the sharp teeth is a knock off.